MONDAY, June 29, is another significant milestone in the history of Brisbane archdiocese, marking the 150th anniversary of the consecration of the diocese’s first bishop James Quinn. Deputy Governor Justice Paul de Jersey, the Catholic bishops of Queensland, heads of various churches and other dignitaries will attend a 10am Mass in St Stephen’s Cathedral on the day to commemorate the occasion. Archbishop John Bathersby of Brisbane will preside. Cardinal George Pell, representing the archdiocese of Sydney, from which the See of Brisbane was carved 150 years ago, will concelebrate along with others. Apostolic nuncio Archbishop Giusepe Lazzrotto will be present to read a papal message in honour of the archdiocesan sesquicentenary. Local involvement has been broadly encouraged, with each parish in the archdiocese invited to send two representatives. An amount of seating is available on a first-come-first-served basis for other members of the archdiocese. A morning tea will follow in the Francis Rush Centre. All priests throughout the state have been invited, especially those celebrating their jubilee of ordination. That includes seven priests celebrating their golden jubilees (50 years of priestly service), seven ruby (40 years, including Bishops William Morris of Toowoomba and Michael Putney of Townsville) and two silver (25 years). 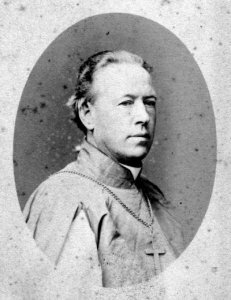 James Quinn was a priest of Dublin archdiocese when he was chosen for episcopal ordination in 1859. With provisioning and recruitment of priests and religious sisters for the new diocese, it was two years before he set foot in the township of Brisbane. “With Bishop Quinn’s chair (his cathedra) located in the cathedral sacristy, there is a very tangible reminder to us every time we are preparing for Mass of the legacy he left here in the archdiocese,” Fr Howell said. Recently Fr Howell had further cause for celebration with the return of the refurbished stained-glass windows that sit above the cathedral altar. These have been meticulously restored and the plate colours are looking vivid and superb.